WEST DES MOINES, IOWA Ask someone like Sam Banks about the tax plan President Donald Trump signed into law Friday, and you hear something other than the effusive joy Republicans in Congress put on display this week. The $1.5 trillion plan cuts taxes broadly while bestowing its richest benefits on companies and wealthy individuals. It is the first major legislative achievement for a president who rode to the White House with the full-throated backing of people like Banks who felt America's economic policies needed a drastic overhaul. Yet Banks, a 50-year-old farmer in sparsely populated southwestern Iowa, regards the tax plan with a blend of indifference and uncertainty tinged with hope. if they don’t want their refund....I’ll take it. They searched for someone who was less than enthusiastic about the tax bill, and decided to push this meme, that even strong Trump supporters don’t like this bill. This is a good example of a type of media bias. They cherry pick the people whom they use in their stories, to slant the story so it reflects badly on the tax bill and Trump. No, they’re serious... ...ly lying. They can’t grasp that over 100 million people are going to be very happy under this new tax code. Why even post MSM fake news? Reading the stooge spin on everything the president does is no longer even mildly funny. More like: most haven’t read it for themselves, so are waiting to see the actual results.  Elimination of personal exemption for dependents over age 16 (yes, a $500 tax credit but that exceeds the current exemption only if one is in a 12.5% bracket. All the above in the interest of being fair and balanced. Agreed. But, of course, no law can satisfy ALL of the people ALL of the time. I guess in the MSM world “shrugs” = “giddy with happiness”. There is no such person as one who doesn’t want to keep as much of his own money as possible. Anybody that says any different is LYING. 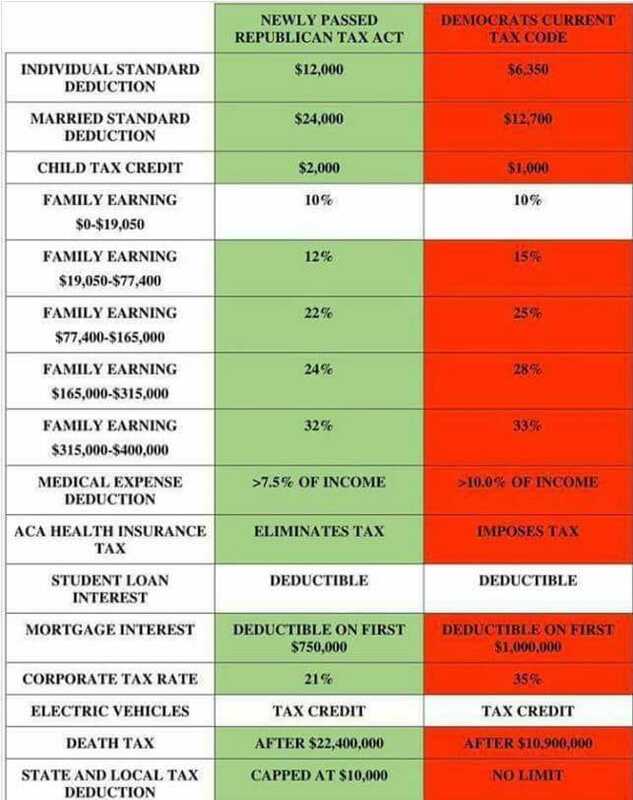 Even liberals, everyone of them that I’ve ever known, likes to pay the least amount possible and none at all, when it comes to taxes. Again, anyone that says any different is a big, fat, LIAR. I’ve never met anyone that tells his/her employer to take out more money out of their paycheck to send to the IRS or to local taxing authorities. I doubt that such a person exists anywhere. The AP cannot be telling the truth (have they ever?) about a farmer or anyone else that doesn’t want lower tax rates. It might not be something to get overly excited about, but, it’s something that any sane person would welcome. Frankly, I’m surprised that the AARP was so asleep at the switch. Not that I am fan of the AARP’s pro-Øbamacare politics.